I read this article and found it very interesting, thought it might be something for you. The article is called Bitesize: Mexxing It Up at 777 and is located at https://www.totallydublin.ie/food-drink/food-drink-features/bitesize-mexxing-it-up-at-777/. Fresh from a recent sojourn in New York City Chef Essa Fakhry has been busy refreshing the menu and mexxing things up at 777 on Dublin’s George’s Street. Influenced by his time in the kitchens of Cosme and Empellon, the new A La Carte menu comes bursting with plenty of citrusy, spicy, bright flavours, with a number of brand new dishes being introduced across all menu selections. New arrivals include innovations such as The ‘Pato’ (€13), a pair of tostados topped with in-house cured duck breast, salsa macha and avocado and The ‘Cauliflower’ (€10) a trio of taquitas topped with roast cauliflower, ha’sikil’p’ak (a Yucatan pumpkin seed dip) black bean and crema. 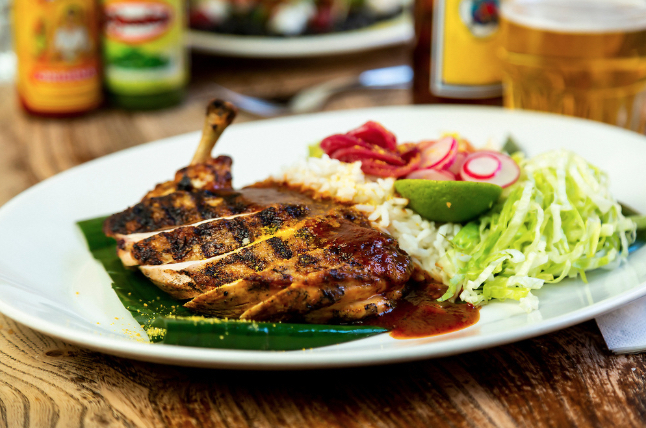 From the Wood-Fired Grill, the ‘Pollo Barbacoa’ (€21) a chargrilled chicken breast arrives sliced and served with barbacoa sauce, rice, radish and avocado. 777’s signature dish ‘Pig’s Head Carnitas’, a feast made for sharing, has also been recharged, with salsa negra, apple and ginger sauce, pico de gallo, elotes and delicious papas fritas.